Ever wondered how solar panels are wired? Have you ever heard about the ways to wire a solar panel? 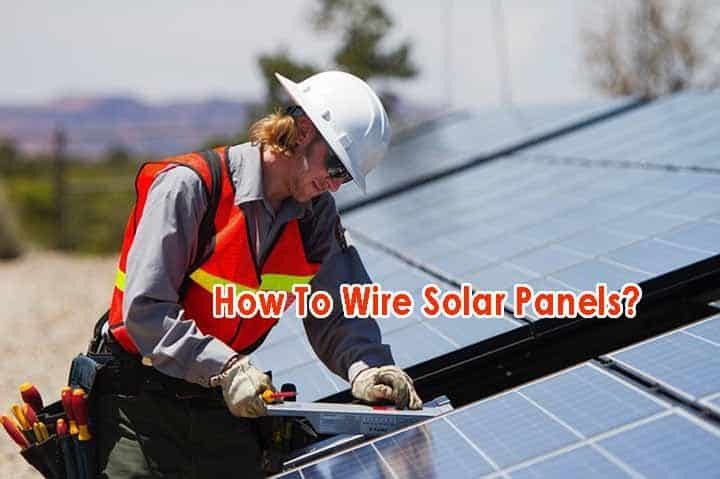 Do not worry if you haven't because, in this article, we will be discussing: how to wire solar panels ? The first thing to know is that there are generally two ways to wire a solar panel and they are; wiring in series and wiring in parallel. I guess you are wondering what difference it makes if you wire the solar panels in series or in parallel. You might think that the most important thing is to have enough energy for your home. We are here to tell you that it does matter and you will be seeing the reasons when we start to write about the types of wiring. Before we start writing about how to wire solar panels in series or parallel, it is important that you understand some basic wiring terms. These terms will help you understand the concept of solar panel wiring better. A circuit is known as the channel in which electrons pass through. It helps to serve as a path through which current or energy flow. There are different types of circuits and the most common ones include batteries, wires, inductors, etc. Voltage can be defined as the difference in charge between two points in an electrical field. This difference is measured in volts. To put voltage in simple terms, it means that when electrons flow through an electrical circuit, voltage is created. Current simply means the rate at which electricity flows and this is always measured in amps. As we have said in previous paragraphs, there are two ways to wire a solar panel and they are; parallel wiring and series wiring. In the following paragraphs, we will be writing about them and teaching you how to wire solar panels. Wiring a solar panel in series involves creating a type of string circuit. This means that the negative (-) terminal will be attached to the positive (+) terminal of the next solar panel. This sequence will then be continued on and on till it reaches a closed loop. One of the most important points to realize about connecting solar panels in series is that the panels are connected in a single continuous line. Wiring solar panels in series are mostly used with smaller solar panels with MPPT controllers. When solar panels are connected in series, you get the voltage rating up but the amp rating doesn’t change. Why You should Wire Your Solar Panels In Series? Now you might be wondering what you stand to gain by connecting your solar panels in series. This is why we have decided to write about its benefits below. One of the major benefits of wiring solar panels in series is that it leads to the dropping of voltage during the charge cycle. This, in turn, leads to the solar panel charging faster and being more efficient. Wiring in series helps you to overcome the loss of efficiency the parallel wiring suffers when longer wires are involved. With this, it doesn’t matter how long the wire is because you will get the same efficiency regardless. This is why it is more advisable to go for series connection when it comes to rooftop solar panels. Unlike wiring solar panels in parallel, wiring in series does not necessarily need thick or high-quality wires. You can get by with any type of wire you have in series wiring and you are assured of having almost the same result. This we can say, makes the series process a cheaper option compared to the parallel wiring. It is normal for any process to have merits and demerits. In the subsequent paragraphs, you will be learning about the demerits of choosing to wire your solar panels in series. Since the solar panels are connected to each other like Christmas tree lights, the moment one of the solar panels go off, the others stop transmitting energy. The current flowing from one solar panel through another will be cut off. This means that you might experience some occasional power outage when dealing with solar panels connected in series. If any of the solar panels are partially covered, then it will affect the power generating ability of the entire solar panel system. To counter this, you will need to connect each solar panel to its own solar controller which will be very costly. To ensure that the solar panel continues to generate energy as it should, make sure you eliminate shading at all costs. Wiring of solar panels in parallel involves a little bit of more work compared to connecting in series. This process does not involve connecting solar panels with each other instead; the solar panels will be connected to a general wire. Ideally, there’s a single wire that connects all the positive terminals together and another that connects all the negative terminals together. When panels are connected in parallel, the total voltage in the circuit does not change. Also, the voltage in each of the solar panels remains constant while the amp of the overall circuit is the addition of all the amp rating of each solar panel. In simple terms, the voltage remains the same but the amp rating continues to increase. Why Should You Go For Parallel Wiring? The benefits of wiring solar panels in parallel are much and we will be writing about some of them below. One of the biggest advantages of connecting solar panels in parallel is that the panels serve as back up for each other. There are times when a solar panel can just develop faults and just stop working. When this happens, the remaining solar systems will continue to work in its place hereby ensuring that there is no loss of energy supply. So, with parallel solar panel wiring, you can rest assured that you will always have an uninterrupted supply of power. When more than two solar panels are connected in parallel, then the effect of shading is reduced significantly. This means that your solar panels will charge better when partially shaded compared to single solar panels. When solar panels are wired in parallel, the charging of the panels tend to become faster and more efficient. You have learnt about the advantages of wiring solar panels in parallel and below, we will be writing about the downsides of this process. When solar panels are connected in parallel, there might be loss of energy during the conversion stage. This can be due to the fact that the wires used are too long hereby reducing the efficiency the solar panel might have when it wasn’t wired together in parallel. Also, there are some cases where inferior cables are used which can also lead to loss of energy or instability in the transfer of current. To counter this issue, ensure you use high-quality wires at all times and make sure that the wire length is as short as possible. Wiring multiple solar panels in parallel require you to use very thick, short and high-quality wires to carry the amp loads. These cables will cost a lot of money especially if you will be installing the solar panels on the rooftop. We will advise that you should ensure you need the power before trying to connect your solar panels in parallel. When designing any type of solar system; either series or parallel, ensure that future expansion is taken into consideration. This is because if you do not think about future expansion, then you might not have the luxury to increase the number of solar panels wired. This sometimes happen because as at when you are setting up your solar panels, you might be limited by budget to add the number of panels that are ideal for your use. To avoid having future problems when trying to add more solar panels, ensure that the installer leaves room for more solar panels. Wiring solar panels in series or in parallel depends on your solar panel design and what you want to achieve. Both systems have their advantages and their disadvantages and if you read our article, you will know which of the systems best suit you. In general, it is easier to wire solar panels in series compared to the parallel wiring. Wiring in parallel, on the other hand, is more expensive but you are assured that when one solar panel is disrupted, others will keep running. Finally, we will advise that you should consider all the factors carefully before deciding on the system you want.